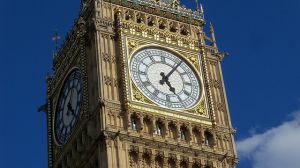 The famous Big Ben bell on the clock tower of the Palace of Westminster in London at noon on August 21 (14:00 Moscow time) will ring the last time before the repair. This was reported by the press service of the British Parliament. It is assumed that the reconstruction works will last until 2021. Despite the repair, the clock will not stop, and the bell will ring "at special moments". The dials on the tower are visible on four sides, one of them will always show the exact time. Big Ben, whose weight is 13.7 tons, rings every hour, additional bells are beaten with an interval of 15 minutes. For 157 years the bell worked almost without pauses. The last time the mechanisms were repaired in 2007, serious repairs were carried out more than 30 years ago. At present, the pendulum, the mechanism itself and the tower need updating. Reconstruction will cost the British budget of 29 million pounds (almost 32 million euros).